Cat Lady Box February 2019 Spoiler + Coupon! Cat Lady Box has announced their February 2019 theme: Meowlentine’s Day! We love our cats more than anything (even when they’re naughty)! So what better day to celebrate our love for them than Meowlentine’s Day! Treat yourself and your kitties to a box of sweet things for you and for them. What do you think of the February spoiler? Check out our Cat Lady Box Reviews to find out more about this subscription! Full details: Coupon code PURRFECT20 good for 20% off your first CatLadybox. 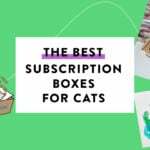 Valid on “Crazy” CatLadyBox regular and gift subscriptions. Offer expires January 22, 2019 at 8 p.m EST. Subscriptions auto-renew at regular price and can be canceled at any time. New subscribers only, please. This is consistently the best box I subscribe to. I’ve subscribed since I adopted a new kitten in July 2017. She loves the toys, and I love that they always come up with things that I would never buy but end up adoring and using all the time. The items that are not my taste become gifts for my feline-fancying friends. And that little kitten, Penny, delights me each month because as soon as I open the box, she noses her way under the tissue paper, pulls out a toy, and starts playing with it. Watching that never gets old. Lovin these retro kitty glasses so much! Those glasses are adorable. Trying to resist subscribing as I haven’t been impressed with their boxes , but so cute! I love these glasses!!! They have a cool retro vibe. The curators at Cat Lady Box always come up with something I would never think of, but that I love and use.